BP-TD9200: READY-TO-USE eneloop 4.8volt 2000mAh NiMH Battery for Philips Baby Monitors. Replaces battery # NA120D05C099. Fits monitor models TD9200, TD9203, TD9205, TD9260, TD9261, TD9262, TD9270, TD9271, TD9272, etc. 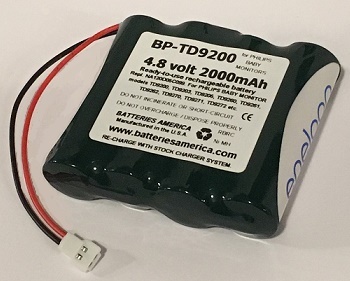 These battery packs are MADE IN THE USA, utilizing ENELOOP NiMH cells. They arrive to you PRE-CHARGED & READY TO USE. Pack has built-in short-circuit protection. When necessary, it can be re-charged with the stock Philips chargers.